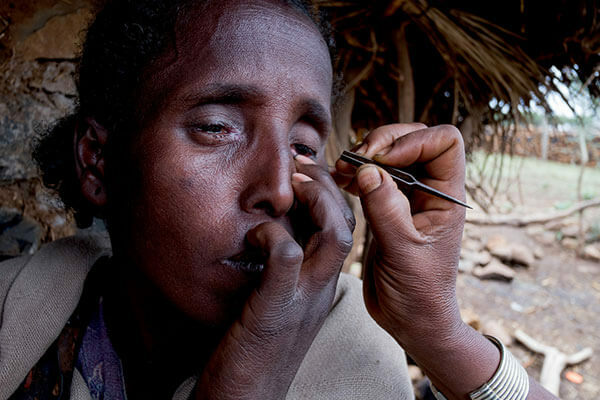 Flies, unsanitary conditions, dirty water and unwashed hands all contribute to the spread of trachoma in impoverished areas like the Amhara region of Ethiopia. These flies are attracted to animal waste, contaminated water—and the wet faces of crying children. They pick up the infection and spread it from person to person. Mothers are afraid to kiss their children or hold them close for fear of spreading the painful disease. Everyone in the community lives with the fear of trachoma. 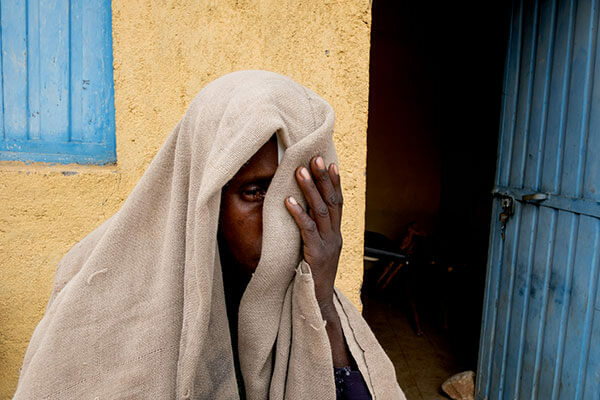 Trachoma can lead to permanent blindness. But it is preventable and treatable—with your help. 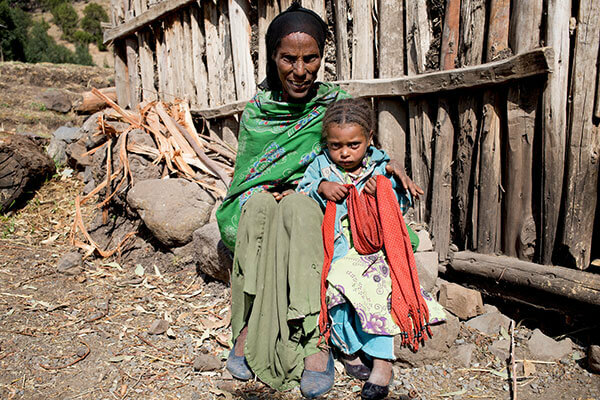 Anele and her children live a difficult life, trying to eke out an existence in the barren, rocky Amhara region of northern Ethiopia. The closest source of water is over an hour away. It’s little more than a muddy pond, shared by animals and humans alike. The stagnant water attracts flies. These flies land on the faces of Anele’s children, infecting them with painful and blinding trachoma. Anele has had repeated infections. The pain is unbearable. Soon, the damage to her cornea will be irreversible. She will be completely blind, and unable to care for her children. Your gift today can bring healing to families like Anele’s. Thanks to the donation of antibiotics from the pharmaceutical company Pfizer Inc.™, your gift will be multiplied EIGHT TIMES in value, giving the gift of sight to eight times as many children and caregivers. The victim comes into contact with the tears or dirty hands of someone with the disease. Flies spread it from face to face. The infection causes painful small cuts on the underside of the eyelid. This leads to scarring. The eyelid starts to turn inward. As the cornea is cut and then heals, scar tissue forms. Sight is clouded. Eventually, the scarring is so bad the cornea is destroyed. The victim is permanently blind. Ripping out eyelashes is torture. But it’s better than the searing pain of trachoma. Trachoma is preventable and treatable. Your gift will send 8 times the value of sight-saving medication. Give today to save 8X as many moms, dads and kids from pain and blindness. 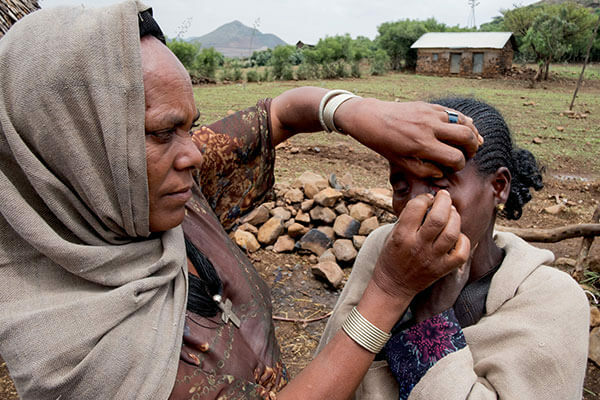 End the pain and blindness of trachoma by helping communities stop the spread of the infection. Hope and Healing International uses the World Health Organization’s proven prevention and treatment strategy to fight trachoma. 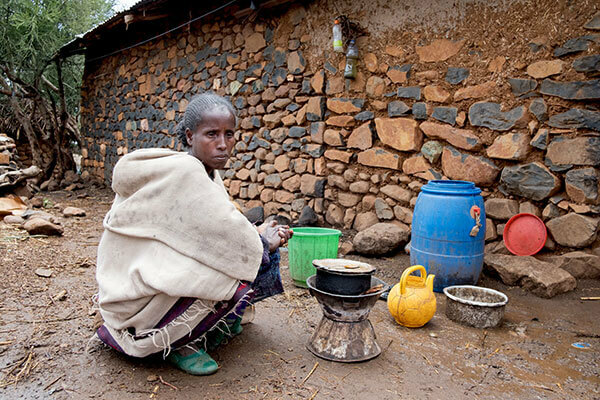 Dinknesh, 38, at her kitchen behind her home in Amhara Region, Ethiopia. Tsehainesh, Dinknesh’s sister, pulls out the painful eyelashes. Local tweezers are used to pluck out eyelashes that cause unbearable pain. Dinknesh prepares to walk home after trichiasis surgery at the health post. Dinknesh was in the final, blinding stage of the disease. She knew she didn’t have much time left before her world went dark and she was unable to care for her family. Even more terrifying was the knowledge that she could spread the disease to her children, leaving them to face the same dark, pain-filled future. Fortunately, a compassionate Hope and Healing International donor paid for her to have sight-saving surgery on both of her infected eyes. 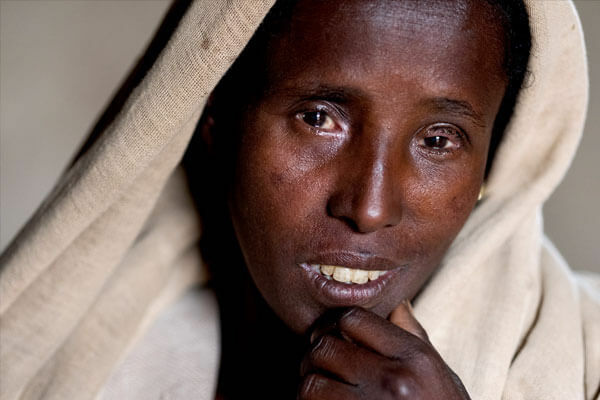 Now she can be free from pain and blindness, and continue to care for her children. Bring healing and hope to more moms like Dinknesh.